Poker is a game of skill, and as such there are strategies that determine what decisions are to be made at specific moments. When you are weak and looking to steal the pot, you will often prefer to be the one moving all in, so that your bluff can fail in only one way rather than in two. In other words, your bluff may fail if your opponent realizes what you are doing and has a sufficiently strong hand to call, but it will not fail because your opponent realizes what you are doing and re-bluffs you with a hand that does not have any showdown value. For example, if the blinds are 250/500 and a very aggressive player raises to 1500 from the button, you would most likely move all in with a hand like KTo if you had around 8000 chips. However, if you had 24,000 chips and your opponent had you covered, you would most likely have to fold. 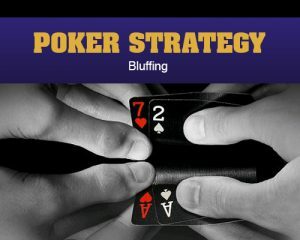 Since a re-raise no longer allows you to put in the last bet, you risk folding the best hand to a re-re-steal, and even if your opponent just calls, you will be playing a big pot out of position with an easily dominated hand. At the very least, if you do attempt a re-steal, it will be because you believe such a play would be profitable with any two cards, not because your KTo is ahead of your opponent’s button raising range. The stack sizes of the players left to act behind you are even more important to consider when you are open raising on a steal or semi-steal. Any time that you open the pre-flop action with a raise, no matter what your position or your hand, you need to look at the stacks of the players behind you, consider how likely each is to call or move all in, and know ahead of time what you will do if that happens. For example, you may be accustomed to raising any Ace if the action folds to you on the button. However, if two aggressive players are in the blinds with five to six times the size of your raise in their stacks, you may have to open fold. Neither of these players is going to cold call your raise, so unless you are prepared to call an all in, you might as well have 72o. The possible results are the same: you either steal the pot pre-flop, or someone moves all in and you fold. You can no longer raise just because you have a hand that figures to be ahead of two random holdings. Instead, you must put your hand into one of two categories: hands that can call an all in, and hands that cannot. Of course you will always raise hands in the first category. Which hands belong in the second category, and the frequency with which you should raise those hands, depends on your read on the players in the blinds and the range of hands with which they will re-raise you all in. Just as in any form of poker, higher level thinking in tournament play requires looking at the entire situation rather than just the two cards you hold.